1) CV: Relevant or Rubbish? The most obvious and still the standard for job employment is the résumé. Keep it short and simple. Make sure the experience you have on your resume is relevant to the job you are applying for. For example, if you are applying for a job title of “Web Operations Coordinator” maybe omitting the paper round you did when you were 12 would be prudent. Hiring managers tend to skim the resume and if it is too long and packed with filler experience that is not relevant, you could risk it being tossed. If you are applying for an entry level job and lack experience in that specific field, add as much work or education experience as you can. In the job descriptions, try to show how your previous experience demanded certain qualities that could appeal to the hiring manager. “Worked at McDonalds” but applying for the “Web Operations Coordinator” position? Try something along the lines of “Ensured all orders were completed in a timely manner,” which HR could see as characteristics of being timely and reliable. Keep it short and simple; try to keep it under a page. In the first paragraph, introduce yourself and show how you heard of the company and how they might know you. In the second paragraph, write about your personal and professional qualities that you could bring to the job. Entice the reader and show them why they should consider you for this position. 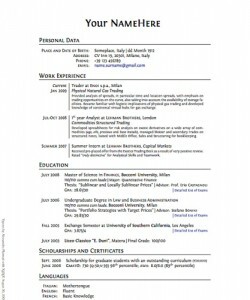 Avoid re-writing your resume in this paragraph – be creative but also be professional. In the closing paragraph, be sure to add your contact information and say something along the lines of “I’d like to thank you for giving me the opportunity to apply for this position”. Show them that you appreciate their time in considering you. Do you use social media? The age of social media is upon us and hiring managers realize that. Many will look at their pile of applicants and fill in a Google search to see what comes up. Some employers even use Klout to judge how good a candidate you are! How employers look at social media is different from a case to case basis. Those that look at sites like Klout will look at how influential you are on the inter-web. Being more influential online might bring more marketable and desirable qualities that the company might want in their employees. Others might simply look at social media pages to get a glimpse of the candidate outside of their resume and cover letter. Job seekers can use social media to follow their prospective employers on sites such as Twitter, Facebook, LinkedIn, YouTube or Google+. They can use this extra knowledge to gain more information about their company, see which qualities they desire and put together a more effective application. Who knows, following a company on Twitter might score you an interview! Before using social media on your application, make sure your pages on those sites are clean. Take away any possible detrimental pictures, comments, notes and anything that a future employer might not enjoy. Do not take away everything though; try to keep it personal, professional but clean. The key here is to find a balance between it all. were more impressed by a candidate’s personal website than any other type of personal branding tool. Before placing your website on employment applications, make sure it is fully developed, professional and provides links to contact information and social media pages. Think of your website as an extra arm to your resume. Avoid typos, redundancies, or anything else that might portray you as an unprofessional candidate. Complete these four steps before you head off to submitting a job application, and you are sure to have a leading edge over most candidates. Be sure to take your time with each step, carefully read, reread, proofread and rewrite if necessary. Have a professional assist you if necessary. Once it is all said and done, find your dream employer’s HR department, and be confident in the quality of your complete application. Author Bio: Olivia Rose spends most her time writing about business; she loves cooking and cycling too – but her passion is blogging about web design and business.